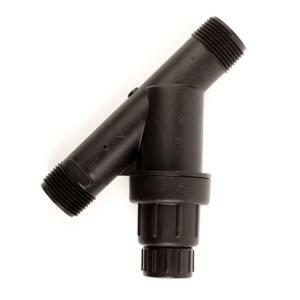 Now you can regulate the pressure and filter your irrigation system with one component. This very compact design allows for easier fitting of components in your valve box. This Pressure Regulating Filter is available in 3/4” and 1” MPT (male pipe thread) sizes. Durable glass-filled polypropylene body comes standard with a 155 mesh screen filter element. Compatible with 3/4" and 1" standard PVC female threaded fittings.